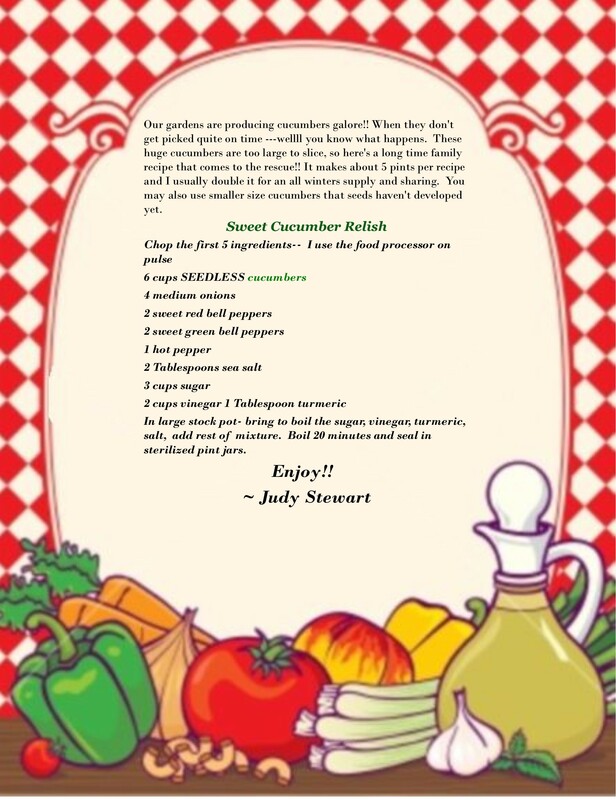 Joann & Judy, our very own Gardening and Cooking Divas have agreed to share their great recipes with a monthly column right here on the Gardening Partners website. 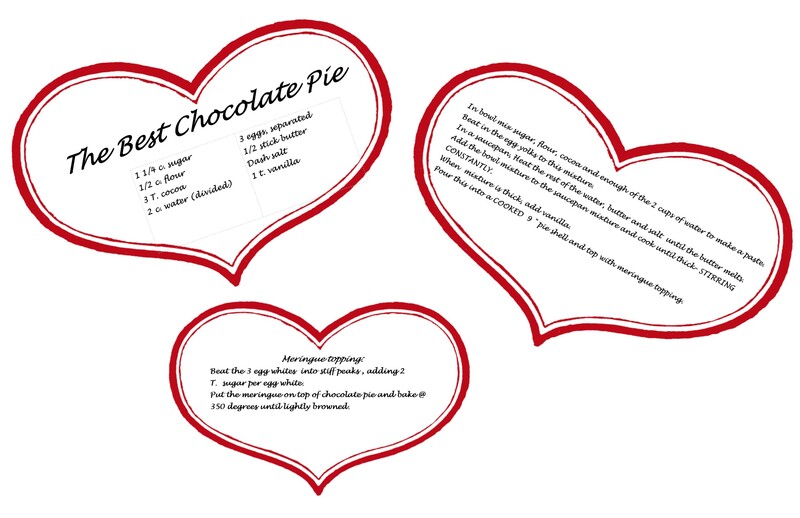 Each month will feature a new recipe, so make sure not to miss any! Both of these ladies are expert gardeners and the creators of many delicious family meals from the everyday to the “company is coming” style. For those who try their hand at recreating these dishes, be sure to share your experiences and photos. This dish reminds me of summers I spent as a child at my grandparents house in South Georgia. At meals, my grandmother would always have a casserole of tomatoes on the table. This version is updated to use healthier ingredients. An easy recipe to use up all those extra tomatoes that you grew, canned, or froze during the summer. 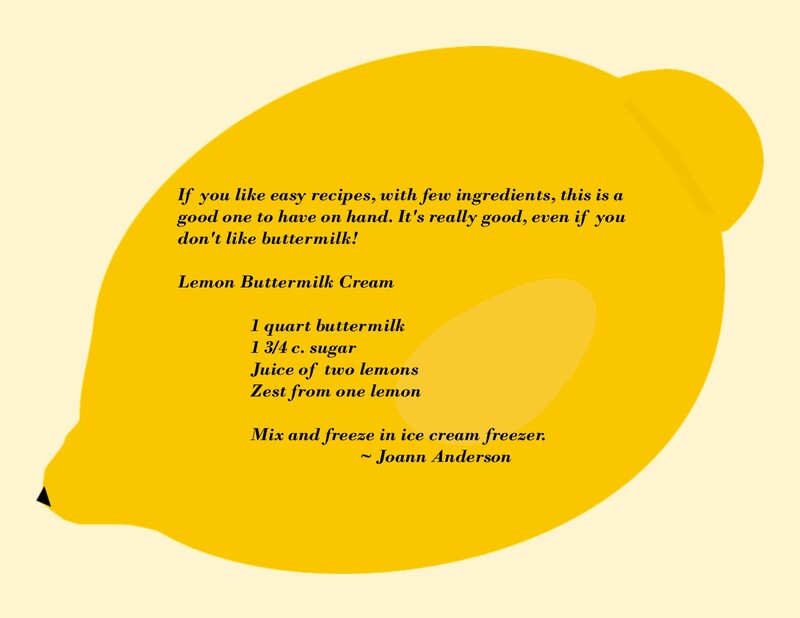 You will always have most ingredients on hand. Instead of fresh garlic and basil, you can use 1-2 tablespoons of Basil Pesto. Adjust herb seasonings to your own taste or experiment with some of your favorites. Great for Pot Luck dinners and easy to double. Hope you enjoy! Heat 3 tablespoons of olive oil in a large (12 inch) saute pan over medium heat. Add the bread cubes and stir to coat with the oil. Cook over medium to medium heat for 5 minutes, stirring often, until the cubes are evenly browned. Meanwhile, combine the tomatoes, garlic, sugar, salt, and pepper in a large bowl. When the bread cubes are done, add the tomato mixture to bread cubes and continue to cook, stirring often, for 5 minutes. Off the heat, stir in the basil. Pour the tomato mixture into a greased shallow (6 to 8 cup) baking dish. Sprinkle evenly with the cheese and drizzle with the remaining 1 tablespoon of olive oil. Bake for 35 to 40 minutes until the top is browned and the tomatoes are bubbly. Serve hot or warm. 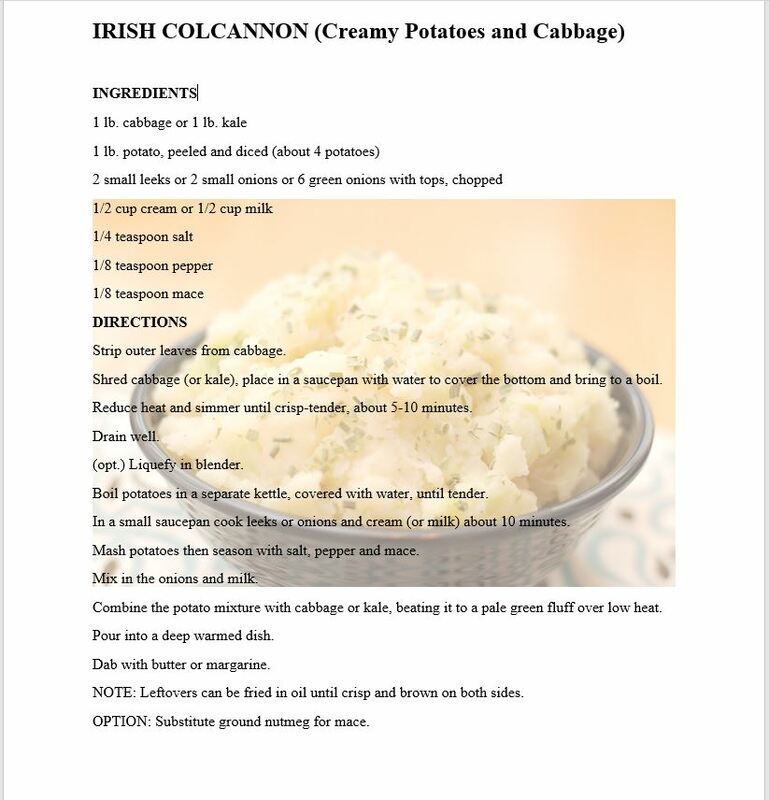 There were many requests for this delicious recipe by Shirley Walker at the December Meeting and Christmas Party. In large pot brown onion, garlic, pork, and beef. Drain off fat. Stir in chopped cabbage, let cook until slightly softened (about 3 minutes). Add all remaining ingredients, bring to a boil and reduce heat to medium. Cover and simmer on low until rice is fully cooked (about 25-30 minutes. Usually the month of October has our first frost around here. Gathering the last of the vegetables from the garden sometimes can be challenging, with “what to do with this now”. This recipe is a great way to use the many peppers; bell, banana, cayenne and others. 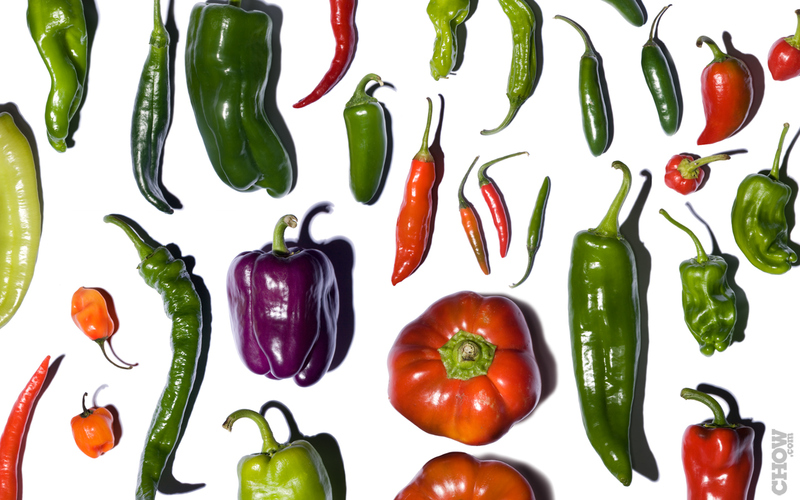 It makes a beautiful relish due to the many colors the peppers add. I can remember using the food grinder before the food processor came into play. Our family has used this recipe for years. I hope you enjoy it, also. Coarsely grind vegetables and place in large container. Pour salt over and allow to stand for 2 hours. Drain Well. To drained vegetables, add seeds, sugar, and vinegar. Mix well. Place in stone crock or into sterilized glass jars for storage. This colorful fall relish is great with beans, pork, or chicken. Makes 1 gallon. No, you don’t cook it and yes, it keeps very, very good!!! I use the food processor to grind- just use pulse to get a medium coarse texture. The OKRA in our garden is working triple time!! It loves the hot, humid, rainy weather we are having. I have never been able to fry okra and have it come out picture perfect with the breading STILL INTACT – until I found this recipe. Try it!! You’ll like it if you like brown, crisp breading intact when taken out of the oil. Wash okra; cut off stems (I cut the small tips off, too) and slice into 1/4 – inch slices. Combine the egg and milk beaten together in a bowl that you can put a lid on and invert to coat the okra. IMPORTANT: have oil hot , then use slotted spoon to transfer the cornmeal coated okra into the HOT OIL. DO NOT STIR UNTIL it has begun to brown. I use a FRY DADDY to cook mine in. I only slide the spoon down the side and lift gently at this point until desired brownness is reached. Again, using the slotted spoon, lift okra from oil onto paper towels to drain. It comes out crunchy, beautifully browned and breading stays put!! 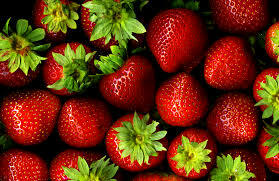 As May rolls around- it brings great fresh strawberries— Hmm- what to do with all of them- Make fresh strawberry pies, strawberry shortcakes- Just eat them fresh with cream? I have another idea. Strawberry Preserves– and just make it as you need it so it will always be FRESH. After eating all you can and while still fresh – just freeze them. Cap the strawberries and freeze, after washing and drying them. You can use fresh unfrozen, or fresh frozen this winter when snow is on the ground. Here’s a simple recipe I’ve used for years. You may also substitute other fruits such as peaches, cherries and raspberries. You may either put in sterile jars and seal at this point or I put mine in glasses with large mouth and plastic lid and keep in refrigerator. Delicious for breakfast and doesn’t last long!! All you need is a hot biscuit. It’s great to have easy recipes when one would rather be in the garden. The following recipe is simple, looks and tastes good, and it can be frozen. Glaze is optional, but gives a more finished look. Another option is to make cupcakes with the batter, decorating with a glaze and shredded coconut. Winter squash has been a staple at our house lately. Finding edible, diabetic friendly recipes, and not using the squash word, has been a challenge. We just refer to it as “winter vegetable”. Acorn squash is easy to grow, keeps for months in cool, dry conditions making it available all winter long. This recipe is simple, and can be adjusted according to your taste and pantry staples. 3 T hot pepper, raspberry, chipotle sauce (which I keep in refrigerator). A substitute could be maple syrup mixed with a sauce of your choice. Heat broiler. Cut top of squash and remove seeds. Then, cut into thin rings. Spread on baking sheet, even layer. Mix oil and sauce, brush on squash. Sprinkle with salt if you wish. Broil until done, about 10 minutes. Turn, and broil other side if needed. 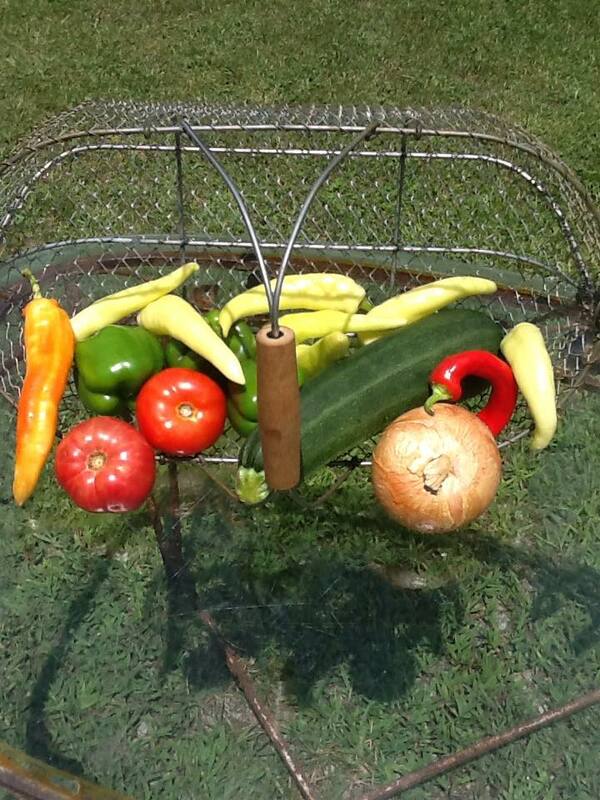 We hope everyone will consider growing more vegetables this year. We had planned to make a Blackberry Cake for our December Meeting. However, due to unforeseen circumstances, that didn’t happen. 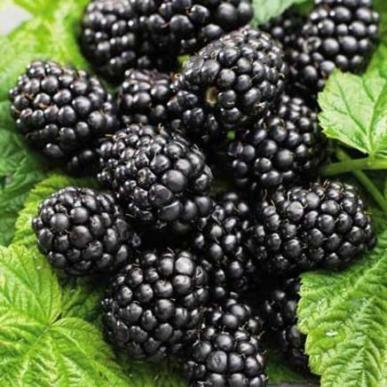 Joann had a wonderful, past life recipe (she thought), and Judy had blackberries on hand. That perfect recipe is not to be found, but we are going to use another one that looks promising and easy. Maybe we will have samples at our January Meeting. Combine first six ingredients in a large mixing bowl. Add eggs, butter, buttermilk, and berries. Beat with electric mixer for one minute, medium speed. Fold in well, the soda, pecans, raisins, and coconut. Spoon batter into a well greased, then floured, ten inch fluted cake pan. Bake 55-60 minutes or until done. Glaze/icing is optional. If you love sweet potatoes, you probably have them at Thanksgiving. This is Judy’s family recipe for Sweet Potato Fiesta. Spread topping evenly and bake, 375 (preheat oven), for 20 minutes. Although I recommend one never experiment with new recipes for the Thanksgiving meal (personal experience), this is an old, tried and true recipe. 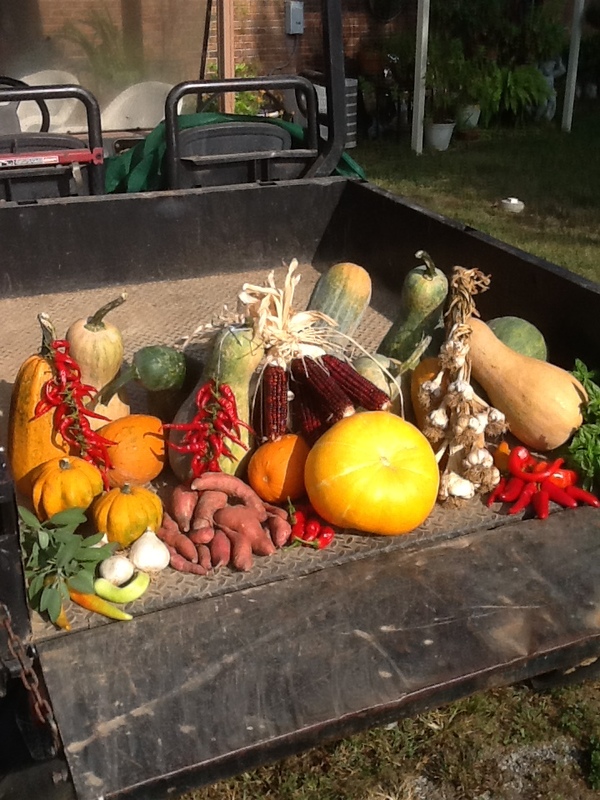 Those beautiful winter squashes are not just for fall decorating. But they do make a pretty display, don’t they. 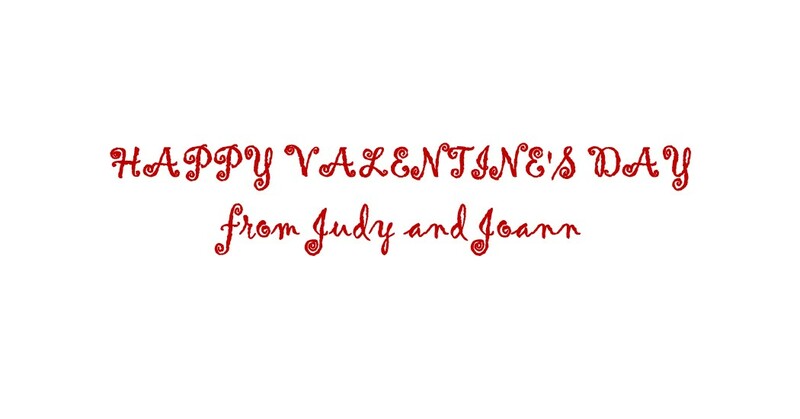 Not everyone has an abundance of them like Judy does, but we can buy and store them this time of year. 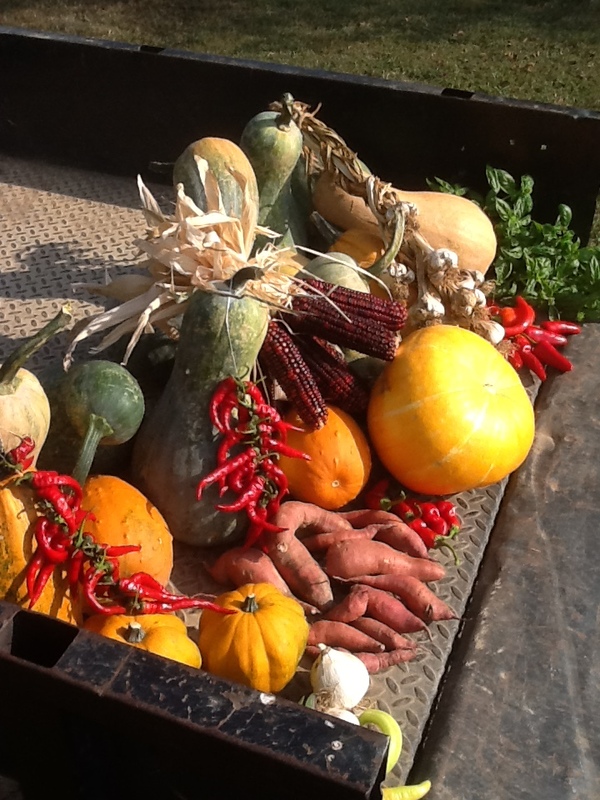 Unlike summer squash, they will keep all winter at room temperature. They also freeze well after cooking. 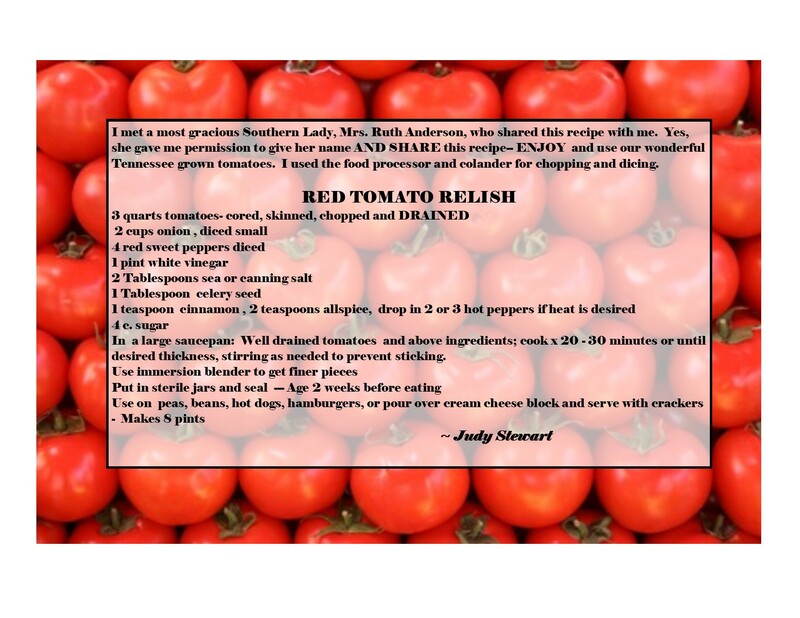 Judy has grown Greek sweet red for a few years now, and we highly recommend it. The following recipe is one I have used for several years. Ingredients are approximate and can vary according to taste. Cut into cubes, about one inch. Toss all with a good olive oil, 3 tablespoons. Place cubes on two baking sheets in a single layer. Lightly sprinkle with salt, pepper, and cinnamon (nutmeg, opt.). Bake 425 degrees for 25-35 minutes or until tender, turning once. Just before removing from oven, sprinkle with dark brown sugar to taste. If you have lots of cherry tomatoes hanging around in your garden, we have just the recipe for you. Surprise, it’s not a salad. Into a large bowl, combine above ingredients. Use one half the basil. Toss well, leaving at room temperature for about an hour. After the sauce has marinated, cook one pound of spaghetti according to package directions or your preference. Drain well, reserving one half cup pasta water. Add the hot pasta to the bowl of tomato sauce, then, add the pasta water, one fourth cup ricotta cheese, and one fourth cup parmesan cheese (freshly grated). Next, add the remaining basil leaves. Combine well. Serve immediately, with more grated parmesan and fresh lemon zest if desired. Save the leftovers. Tasted great, cold, straight out of the fridge. Once again, we were lucky enough to attend the presentation of the UT “Kitchen Divas” at Summer Celebration. 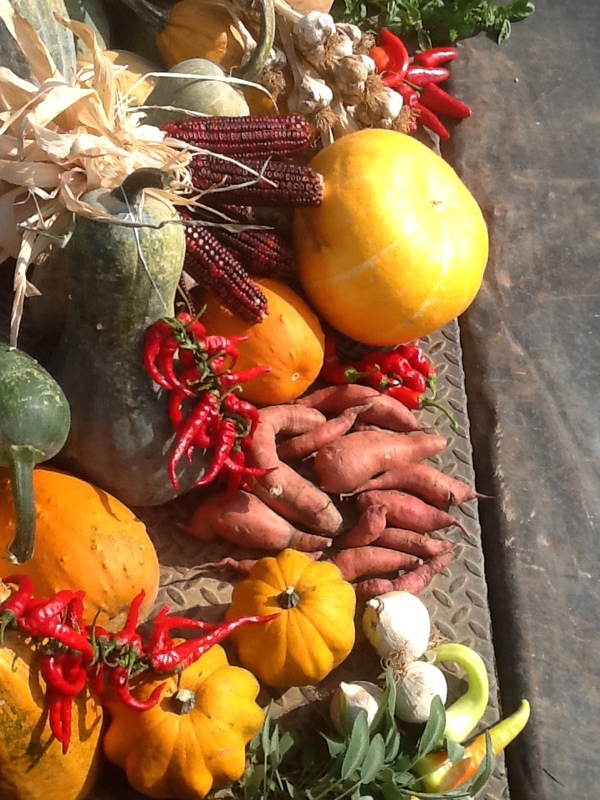 This time, squash was the star of the show, yes, squash! Both winter and summer squash. And, we heard no complaints. 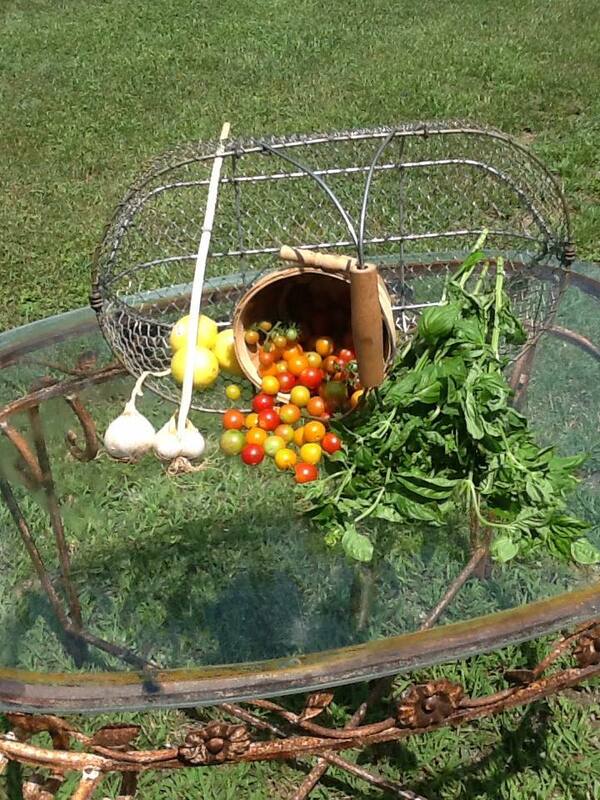 We are passing along one recipe that might help you use some of your garden bounty at this time. It’s easy and, of course, everything is better with bacon. Some of you will recognize this dish that Judy brought to the July meeting, and the vegetables used were grown in the Stewart garden. This is a good dish to have the grandchildren “count the colors and vegetables”. Layer vegetables, in 11×14 pan, beginning with zucchini slices. Sprinkle some seasoning salt on zucchini slices. Next, add tomato, and then the onion slices. The next layer is pepper slices. Then layer bacon pieces. Next, add shredded cheddar cheese, covering the other layers. Bake, UNCOVERED, 350 degrees for 45 minutes, or until the cheese starts to brown. Serve hot. Let us know if you try this. Also, you might add other vegetables. Just be aware that it can be watery if you don’t drain the vegetables first. Categories: Uncategorized | Tags: blackberry, buttermilk, butternut squash, cake, carrots, cooking, cream, cucumber, diva, divas, joann, judy, June, lemon, october, olive oil, parsnips, pepper, recipe, relish, sweet potato | Permalink. Looking forward to all of your recipes! I know you are great cooks from things you have brought to the monthly meetings! !